In 1965 the Beatles are in Austria for the first time in their career. In Obertauern they want to shoot scenes for their movie „Help“. 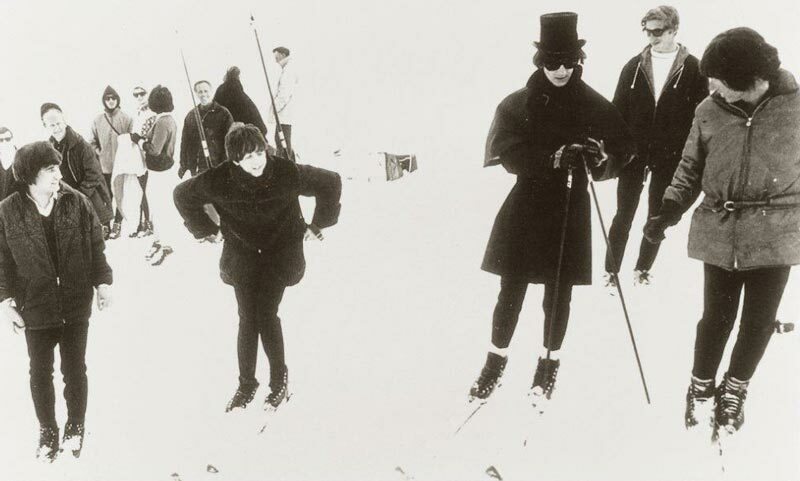 There is only one problem: None of the Fab Four can ski. They have to rely on doubles for the wild chases down the piste. A village in Austria, 1900 yards above sea level, surrounded by a beautiful mountain scenery. The year: 1965. It’s a late afternoon in March and there’s still heaps of snow everywhere around. That village, Obertauern, is small and sleepy. It’s not a quarter as touristy as it is today. It can only be reached via a steep pass that is exposed to avalanches. There are yet no legendary parties in alpine huts, no heated chairlifts and nobody has ever heard about apres ski. After a day of skiing, young men sometimes gather around a bonfire to play Austrian folk songs on the guitar and while away the time. Eight young men have met in a room in the hotel Edelweiß – which is one of the best known hotels of the village at the time. Four of them have long hair, four of them wear it short. The long-haired guys have taken out their guitars and bass and make music. The other four listen to the rhythm. The Beatles are giving a private concert. They are performing in front of what possibly is the smallest audience they ever had. John Lennon, Paul McCartney, Ringo Starr and George Harrison are at the peak of their career. They are making their second movie. Here, in the seclusion of the alpine village, they are shooting the skiing scenes. They fill major concert halls across Europe and even cause excitement beyond the Atlantic Ocean. Their appearance causes young girls to faint by the dozen. In Obertauern they are taken for girls themselves. According to village gossip, an onlooker has called them „Weiber“ – broads – on their arrival. But apart from that the locals don’t take much notice. They have nothing against their famous guests but they have no idea what to do with them. The movie the Beatles are working on is „Help“. The action is supposed to take place in Switzerland – but the script demands for a place with a snow guaranty, a mountain lake and a train station. 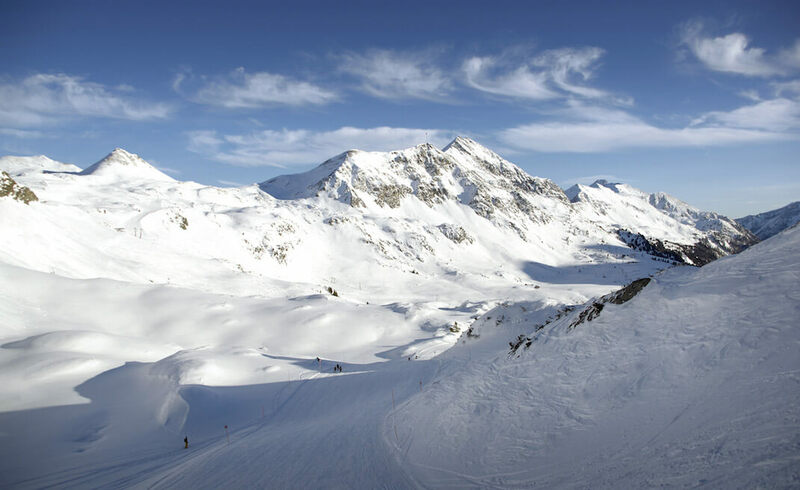 Obertauern offers all that. After the spontaneous private concert, Paul McCartney asks his listeners for feedback. Did they like it? Herbert Lürzer, Hans Pretschner, Franz Bogensperger and Gerhard Krings aren’t easy to convince. God knows they aren’t used to the kind of music they just heard, in the mid sixties, in their small alpine village. But they can ski. Which is something the Fab Four are totally not capable of. Only John Lennon has ever stood on skis. But he isn’t truly gifted. Thus, they need doubles. And so, on the first day of shooting, the international stars from Liverpool meet the double Beatles at the Kirchbühel ski lift. The four athletic young men from Obertauern will stay at their side for the next couple of days. And they will give their best to teach them how to ski. „They were able to skid in the end“, remembers Herbert Lürzer. The double McCartney of that time is now 71 years old. He has lived in Obertauern ever since and now owns the hotel Edelweiss. He doesn’t own any Beatles album until today. The Austrian doubles haven’t been chosen because of their resemblance to the Beatles. Andreas Krallinger senior, manager of the local ski school, was asked to search for four young men that couldn’t only ski but also speak English. Two of them, the skiing instructors Herbert Lürzer and Gerhard Krings are fluent in the language. Lürzer has learned it while working as a hotelier on a Channel Island. They perform their stunts blindfold. Later, they will declare them „damn stupid“. The plot remains cryptic to many – even those working on the set. „Nobody actually knows the story“, McCartney double Lürzer says today. He has first seen the movie years after its release. Long haired wigs, thick makeup and dark suits let the double Beatles look similar to the real ones. Confusingly similar. According to village gossip, Maureen Starkey, newly wed to Ringo Starr, is said to have accidentally kissed Franz Bogensperger instead of her husband. They all give autographs. The Beatles’ presence in Obertauern cannot remain a secret forever. The Fab Four are cut off from the media world since their arrival in Salzburg and the following press conference. Journalists aren’t welcome at the set and there are no interview appointments. 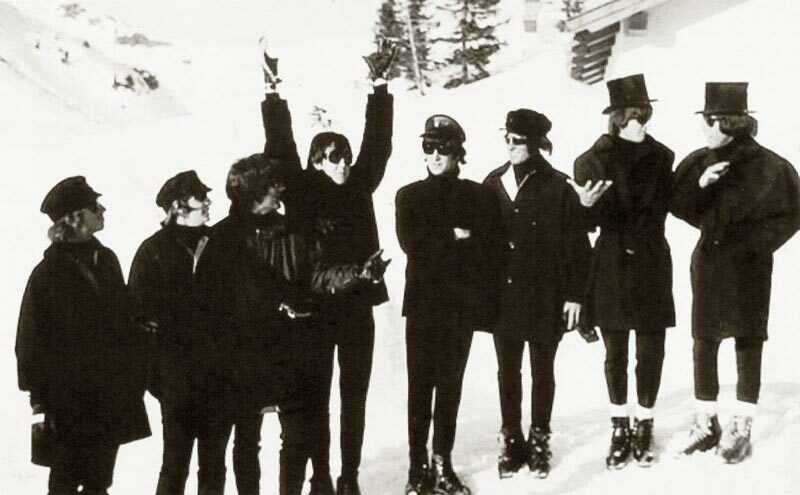 The Beatles rather fool around on the piste. Still, the Austrian media is present in Obertauern and reports on the shooting. Rumor has it that a journalist even pays a young woman to race into the film crew on her skis to have a story. Also, there’s a lot of gossip about concerts that never take place. The Beatles do give a spontaneous public concert in the end. On the occasion of assistant producer Clive Reed’s birthday there’s a small party in the hotel Marietta, some hundred yards away from the hotel Edelweiß, where the rest of the film crew is housed. The actors and their doubles are present as well. Late in the evening the Beatles rush on stage. The hotel bar is so crowded that even the hotel director has no chance to ensure law and order. A couple of guests have complained about the nightly disturbance. But there’s no way through to the stage. The instruments of the hotel band get severely damaged. A couple of broken piano strings and a destroyed drum are the result of the legendary party night. John, Paul, Ringo and George play like they want to win over even the last Austrian folk music lover. It is the first concert of the Beatles in Austria – and it will be the last. Curious about the movie? Find Help! on Amazon. I was invited to Obertauern by the Tourismusverband Obertauern. 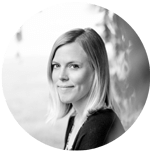 Anna loves travel, photography, and writing. All at once, everyday. She collects entrance cards, plane tickets, and old atlases and has been searching for the perfect globe for some years. Follow Anna on Facebook or Twitter! For security reasons, we store your data name, email, website (if provided), and IP-Address) in our database. By submitting your comment, you agree to that. Do not worry, there is nothing else we do to your data unless your comment contains unlawful passages (in which case we will delete your entry anyway.) See Data Protection.